Potential recruits must be able to operate in accordance to Pacific Standard Time (PST). This may present a problem for international players. Our primary recruitment pool is the U.S. and Canada. We are not actively recruiting from other regions except under extraordinary circumstances. Multi-Clanning is not allowed. Joining another ArmA 3 milsim unit while a part of the 21st will result in being released from the unit with dishonorable discharge. Double check your enjin profile, and verify you are not a member of other milsim communities or units prior to applying. Island life groups, or communities for other games are fine. 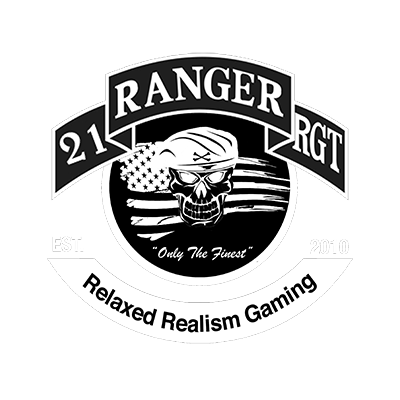 Upon enlisting in the 21st U.S. Army Ranger RGT, new recruits MUST attend an event within 14 days or submit an LoA explaining their abscence. Recruits who fail to attend an event (either an operation or training) within 14 days will be discharged on the basis of inactivity. Beginning with your name, callsigns need to be short and easy to pronounce. No profanity is accepted in names or callsigns to be used on 21st servers. Rank needs to be clearly displayed in front of each member’s name. Rank formatting is simple and requires the rank abbreviation, capitalized, followed by a space, then the member’s name or callsign. No brackets, periods, or special characters of any kind. Here is an example of proper name and rank format: PV2 J. Doe. The only deviations would be under the event we have two or more members in the 21st with the exact same name or callsign. Do not follow the name by any tags or special characters. We do not wear clan tags. When addressing members of higher rank you must address them as either their rank or name and rank. "dude” will not suffice. You can call officers "sir” if you want but it is not required. Note that NCOs should not be addressed as sir. When out of game, this rule is more relaxed, but while on base or during operations, members must be addressed by their proper title or callsign. Regarding uniforms, all uniforms are selected by the command staff of the unit. No changes may be may be made to uniforms without clearance from unit COs. This includes custom texture modification, modification to nametapes, shoulder patches, or XMLs. All 21st members must look uniform in order to prevent misidentifications and friendly fire in combat. In reference to camo types, these will also be designated by command staff prior to deployment depending on the terrain in the area. Custom faces and face paints are accepted, but must be limited resolution images in order to load properly on the server and not lag other players. Vanilla Arma 3 faces are fine to use. No beard attachments, no mustaches, no clown makeup, and no overly silly face textures. Feel free to use any masks, face paints or further attachments added by our mod pack under your player profile in accordance to our uniform regulations. - Element leaders reserve the right to reject custom faces if deemed unacceptable at any time. - Offensive content of any kind textured onto the face is not acceptable. - Modifying the eyes of the player outside of minor color adjustments is not acceptable. No unnatural shapes, layers, or colors. - Regarding large/entire face paints, neon and other bright colors are not allowed as they are too unrealistic and distracting. We have a zero tolerance for any forms of cheating, or use of mods that enhance your combat effectiveness beyond that of other players. Any mod that gives you open access to virtual arsenal systems (VAA), increase movement speed, or mods that enhance your HUD with unrealistic displays are outlawed. Audio and video recording or streaming is strictly prohibited during all training events, drill days, and staff meetings. Our promotion policy is based off of individual combat and overall unit performance. Kills will not get you rank. Often times, element leaders will recognize their soldiers for all actions unit related, in, or out of game and recommend them for a promotion or award. Ranks are something to congratulate other members on achieving, not show jealousy and the "it should have been me” mentality. While in any official 21st servers you must conduct yourself in correlation with our unit standards at all times. No exceptions. Keep the chats completely clear of all religious, ethnic, or political debates and topics. Racism is not accepted at any time in any form. Do not make any remarks that could potentially offend another player. Keep in mind that our unit is made up of all kinds of people, from different areas and backgrounds. Do not take a chance by making an inconsiderate comment. Additionally, keep chats clear of any and all pornographic material. We have minors in this community, making it illegal for them to view any pornographic content. Do not move people out of the channels for fun or without prior consent. Finally, the private quarters of the Element Leaders and TOC are to be treated as private offices. If two or more people are in someone's Private Quarters, please message them asking for permission, and receive permission, before entering the room. Respect other players 100% of the time. Never put another member down based on poor combat or communication performance. Never question the words of our officers or command staff. Lock it up immediately when ordered to by an officer. We need silence in order to speak about important information that you would most likely miss if you were talking through it. Never poke or message command staff at any time during an operation. This distracts from our positions of responsibility and can cause accidents during deployment. Never poke or message Recruitment Officers about potential recruits waiting in the lobbies unless you are a Master Recruiter. Our Recruitment Officers volunteer their time to help expand the unit, please do not harrass them by telling them to do their jobs. More often then not they are already aware of people waiting in the lobbies. Keep the in-game chat clear 100% of the time. Occasionally, during the briefing, command staff may send messages via the global chat system, but never type during deployment at any time. If you lose your radio and cannot contact anybody, it is on you to find your way back to link up with friendlies. It’s a military simulation not an instant messaging program. Never join an operation of any kind more than 15 minutes late without first notifying your commanding officer. No exceptions. You cannot under any circumstances show up two hours late for an operations and expect to just join in progress. This is not join and play. Make an open effort to help newer players to the game. Experience levels vary across our player base. Some members have had the game for years, some members just downloaded it today. Insulting another player for being "new” does not propose a solution. Don’t be that guy. Elitist attitudes are grounds for removal. Remember that even when you are not in our servers you represent the clan. Always uphold a positive standard when in additional private or public servers. Represent our unit well. Always keep your weapon on safety unless on an open firing range. No exceptions. Misfires and negligent discharges could potentially kill you or another teammate. Treat it as a real firearm exercise caution at all times. Never teamkill at any time. This is a bannable offense in this unit. If you want to PVP, join an independent server. Keep it out of ours. Respect other players on base. They are there to practice. That should speak for itself. Give respect and you shall receive it. Keep the base clean. This base runs 24/7 when we are not conducting operations. Put things back where you found them when you are done so that it is ready for the next person to come on and practice. Obey the community standards that are clearly outlined in our Unit Regulations. These regulations do not "go away" simply because an admin is not watching you. Obey the terms and conditions of our content license enclosed with original 21st content. External sessions and dedicated servers are NOT ALLOWED to host 21st content as defined in our Content License. External sessions and dedicated servers are NOT ALLOWED to be hosted and used in combination with official 21st servers including Teamspeak 3 and our in-game dedicated servers. Don't use our community to host your own events without approval from our command staff. Members of this unit are NOT ALLOWED to accept monetary transactions except under the condition of donating to the unit's non-profit server fund. Do not give money to another member to help fund a project, server, or any other content. 21st Relaxed Realism Gaming is not responsible for any money gained or lost in monetary transactions external to our secure donation system. "Off The Clock Operations" are defined as custom missions that 21st members have created external to official campaigns and gametypes. These operations ARE ALLOWED to be hosted in public/private settings in combination with official 21st servers including Teamspeak 3 and our in-game dedicated servers so long as they do not interfere with officially planned events. You cannot host your own mission while we already have one running. Furthermore, the hosting method (either "home-hosted" or a dedicated server) is NOT ALLOWED to be left running when the HOST is not present. Host your session, play it, then take it offline. You cannot start your own dedicated server and provide it as a "service" to the unit no matter what the conditions, as it pulls attention away from officially supported 21st content. All hosting and server related discussion, expansion, or modification MUST BE approved by the command staff of the unit. Allocation of unit funding, memory usage, web-service integration, or any other project MUST BE approved by the command staff of the unit prior to implementation. - Failure to obey any of these rules or regulations previously defined will result in suspension or immediate dishonorable discharge from the unit.